A bright blue beach hut mounted prominently near its front door proudly proclaims Cleveland Library’s arrival in the Little Free Library movement. Beckoning to passers-by, it has a very clear call to action – put away your smart phones and tablets, and get stuck into a good old-fashioned book! The brainchild of international not-for-profit organisation Little Free Library, these 24/7 ‘take a book, leave a book’ free book exchanges are all about inspiring a love of reading and building community spirit. Since the first Little Free Library seven years ago, more than 50,000 have sprung up in over 70 countries around the world, with millions of books exchanged every year. Redland City resident Bonnie Williams takes a book from the Little Library in Cleveland. 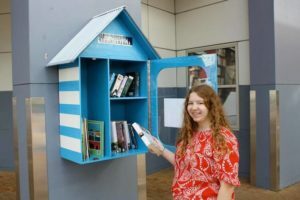 Redland City Mayor Karen Williams said Cleveland’s Little Free Library is just one small ingredient in the progressive reinvention of Redlands’ Libraries from information resource centres to community hubs. “Gone are the days of a stern librarian peering over the top of her glasses, shushing anyone who dares to raise their voice above a whisper. We now actively encourage community interaction in our libraries,” Cr Williams said. “Whether people come simply to read and relax, use our computers, bring their children to story time, attend our interactive talks, or now use our free book exchange, we want them to feel comfortable, uninhibited and at home. “And we’re also increasingly taking the action outside our library doors. The Little Free Library is part of the 7 Day Makeover, which is all about celebrating and encouraging better use of our wonderful outdoor spaces here in the Redlands. Cr Williams said the successful makeover initiative saw dozens of volunteers transform the streetscape of Cleveland with creative, curious and quirky street furniture, sculpture and play spaces.